The 2018 show calendar begins with the EAG, the British amusement show that will take place at London’s Excel between the 16th and 18th of January. SUZOHAPP will be exhibiting at Booth #400, showing its comprehensive portfolio of products for the Amusement industry. “This year, we have increased our booth size to showcase our complete range of solutions, from individual components to complete cash management systems,” commented John Vallis, SUZOHAPP UK Sales Director and Vice President Amusement Sales EMEA. For cashless solutions, visitors will have the opportunity to learn more about IDEAL. The IDEAL solution brings simplicity to a complex payment structure that can often be found in family entertainment centers. IDEAL is flexible and secure and provides operators with a host of benefits through the sheer number of individual services – all of which can be managed by this one system. IDEAL is card-based with various card reading abilities, making the solution very user-friendly. Customers can pay using the IDEAL cards anywhere in the location, they can extend card credit using the IDEAL self-service kiosks or, in the case of plastic cards, even by mobile phone. 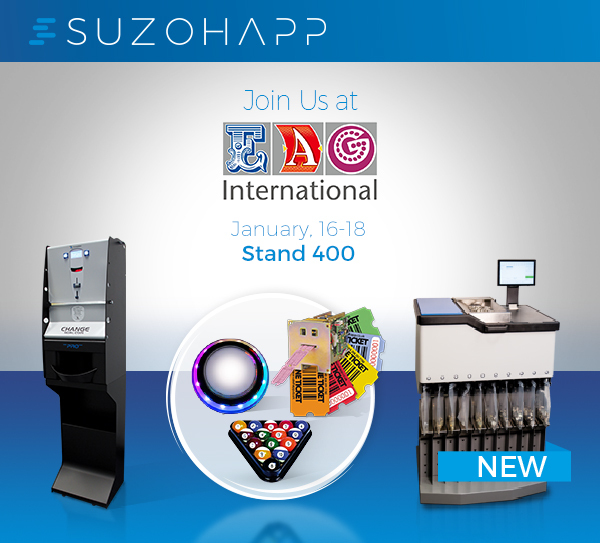 Cash handling equipment is a prominent offering in the SUZOHAPP portfolio and a broad range of components for manufacturers will be showcased at EAG. For coin-in, show attendees can see the Comestero RM5 electronic coin mechanism that offers excellent coin discrimination and market-leading anti-fraud technology. For coin-out, they will appreciate the advantages of a variety of hoppers. Buttons and joysticks are essential on every amusement machine and SUZOHAPP continues to invest in this control technology. A rich assortment of control solutions will be displayed and special focus will be given to the UFO and Jumbo pushbuttons. The SUZOHAPP team will be presenting a new joystick on their stand as well. Finally, other solutions on exhibit include a selection from BilliardPRO and CompetitionPRO product lines. “We are always ready to meet the unique requirements of both manufacturers and operators. The new ICX Active-9 is a clear example of how we can meet operators’ expectations and solve their individual problems. Please stop by our Stand #400 and see how our solutions can really improve your business!” concluded Mr. Vallis. SUZOHAPP is a technology company providing software and hardware for cash handling automation and self-service solutions to more than 25,000 customers throughout the world. SUZOHAPP’s technology enables automation for customers operating in a variety of end markets, including retail, transportation, gaming, banking, vending and amusement. SUZOHAPP’s solutions include cash deposit, recycling, processing and payment systems as well as a broad range of self-service component technologies. The brands of SCAN COIN, Comestero and CashComplete™ are united under the SUZOHAPP Company. SUZOHAPP’s more than 1,100 employees operate in 19 countries and its dealer network covers more than 100 countries. More information is available at www.suzohapp.com. SUZOHAPP is owned by affiliates of ACON Investments, L.L.C., a Washington, D.C.- based international private equity investment firm that has responsibility for managing approximately $4.4 billion of capital. For more information, visit www.aconinvestments.com.